You know the rule: at the dinner table you should never talk about religion or politics. or GMOs. But we are going there. Because science. Sadly (or not so sadly if you are of the opinion that these for-profit schools are predatory) the science of cooking will no longer be taught at Le Cordon Bleu in Cambridge — or anywhere else in the country for that matter. You know what's the opposite of sad? The fact that we might actually get a real-life cat café in Boston. Unless you are allergic. Then you might be sad that you can't pet all the cute, adoptable kitties that will, to quote Beyoncé, "kiss up, and rub up, and feel up, on you all night looooong." Few things fire people up like the debate over GMO food. Is it safe? Should we label it? Are we eschewing scientific facts in favor of fear-mongering? The National Academy of Sciences released another report this week resoundingly restating that yes, GMOs are totally safe to eat. This is consistent with what most of the scientific community has said all along — but many people really don’t want to hear it. In case this news makes you want to go and give Monsanto a big bear hug (kidding) — you should know the scientists are also calling out overblown claims about how effective GMOs are at increasing crop-yields . Additionally, the academy is calling for more regulation as new types of plant breeding are being introduced, to be sure no new risks sprout up. You can listen to NPR’s breakdown here, or read the report yourself. For another in-depth look we’re throwing it back to this article, which Amanda Balagur wrote on the subject when Craving Boston was just a baby brand new website last fall. In good news for crazy cat ladies (including the writer of this round-up) a cat café could finally be coming to Boston. Respect to Eater for choronicaling the will-they-won't-they-open saga. What’s taken so long?? Um, health codes. And all that jazz. But according to the article, Diane Kelly, the woman behind PURR has found a loophole — having food and drink delivered from another eatery. Follow her progress on PURR’s popular Facebook page. The Globe food section ran a piece by Amy Crawford on the closing of Le Cordon Bleu College of Culinary Arts in Cambridge — as well as the other 15 branches across the nation. As the article points out — and anyone who has worked for $10 an hour in a restaurant kitchen knows — the amount of debt you can take on for the degree, doesn’t seem to justify the meager wages you’ll likely make cooking in a professional kitchen. This all comes at a time when for-profit schools in general are getting a lot of heat for saddling students with debt and not necessarily passing along skills which will allow them to pay it back. I actually made $11 when I was a prepared foods cook, maybe I can thank my culinary degree for the bump? 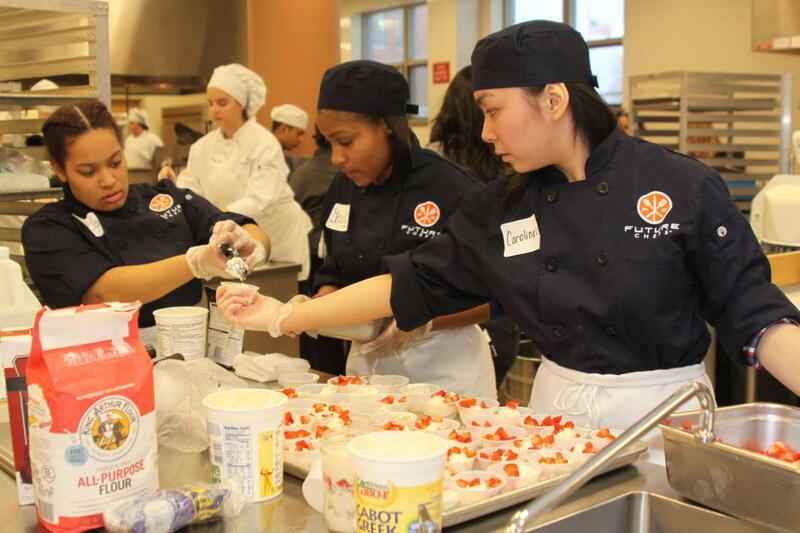 The Globe article also mentions Future Chefs, a Boston non-profit culinary training progam that our contributor Ellen Bhang has been exploring. Look for her interview with executive director Toni Elka later this month.